A local priest by the name of Richard Master believed in Barton’s visions and reported them to the Archbishop of Canterbury, William Warham. From there the story of the prophetic girl grew and grew. This engraving of Elizabeth Barton is probably by Thomas Holloway based on a painting by Henry Tresham, and comes from David Hume’s History of England (1793–1806). Elizabeth Barton was not alone, also implicated in her downfall were: Edward Bocking (monk), John Dering (monk), Richard Master, Harry Gold (priest), Hugh Riche (friar) and Richard Risby (friar). The charges that were brought against Bocking were that he frequently railed against Henry’s upcoming marriage to Anne Boleyn. 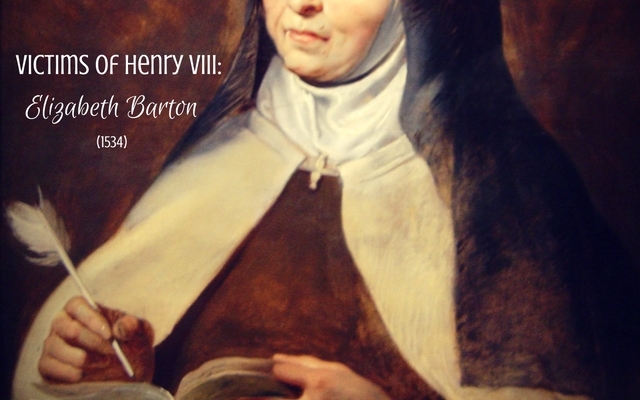 Barton, to please Bocking, claimed to have a revelation from God that the King would not live a month after his marriage; and when it failed to come to fruition she claimed to have another vision that the King was no longer accepted King, by God, after his marriage. Barton eventually confessed that she was the cause “of all this mischief,” and that by her falsehood deceived “all these persons” but this did not save them. At that point it was too late and there was too much evidence to prove their involvement. On the 20th of April 1534, Barton, Bocking, Dering, Gold, Riche and Risby were all drawn on a hurdle (fastened to a hurdle, or wooden panel, and drawn by horse to the place of execution) from the Tower of London to Tyburn. At Tyburn they were hanged and beheaded with their heads set on London Bridge or at the gates of the city, which was customary to warn off others from participating in similar antics. Richard Master received a stay of execution and was pardoned. It is believed that he signed the oath of succession, which both Riche and Risby were also offered but they declined. It is believed that Master was offered this because it coincided with the swearing of the citizens of London to the oath. Elizabeth Barton was around 28 years old when she was executed. I believe the cover photo for the article is a painting of St. Teresa of Avila. I have seen it in several other places under that name, but never Elizabeth Barton. Perhaps a mix-up? I knew of her but she also made some of the wall predictions. She was controlled totally by a few who were trying to bring people back into fold. By then they knew the heavy hand of King Henry and nothing was going to stop from what he wanted. He just beginning to find his power and the church didn’t scare him. Though on his death bed he was holding a rosary. Wonder if he repented and asked for Confession? Henry stayed with many practices of the Catholic church, his biggest difference being that he rejected the authority of the pope. He still went to masses that were in Latin, and created a new set of factions based on religion in his court. Bishops like Gardiner were Catholic, Gardiner himself tried to convince Henry to try Katherine Parr for heresy for her Protestant beliefs. 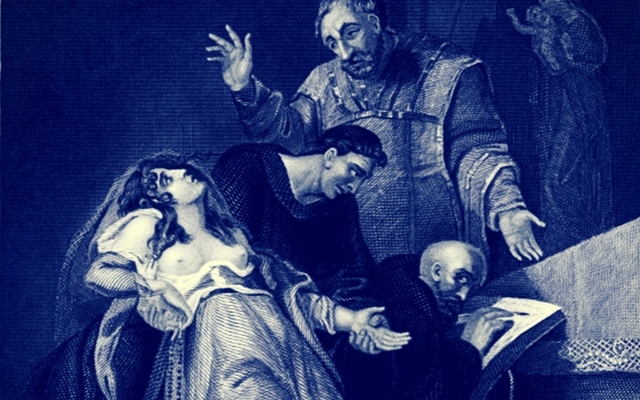 His Archbishop of Canterbury Cranmer was a protestant who was burned at the stake by Mary I. He really didn’t have a rhyme or reason to his religious policy, but in practice he remained Catholic to the end of his life. He never stopped going to confession, hearing Mass, or thinking he was Catholic. Henry would NEVER have considered himself Protestant, not for a moment. He loathed Protestantism. Although there is a clear rhyme and reason to his religious changes: they reflect whatever he wanted his church to do for him at the moment. Novelists who make Henry profess himself a Protestant – or, infinitely worse, Anne Boleyn, who died before the word existed! – are the bane of historians.